Bienvenue à la La France! Est-ce que je peux vous aider? Que voudriez-vous avoir hui?Oops! I have forgotten that I am not in France but I am surely having French food over here now. Haha! By the way, those words meant “Welcome to La France! How can I help you? What would you like to have today?” Why was I mumbling in French when I am right here in Penang, Malaysia? Well, here’s the answer. Please read on. Have you been to the Northam Beach Café for the past 6 months? You would have noticed that there is a stall selling French food by a young couple. The hubby is a Frenchman whereas the wife is our local Chinese who can speak real fluent Hokkien. One look at the menu and you might be wondering why they are serving omelettes, crepes and Ciabatta or white breads during dinner time. As for the locals, those are for breakfast. 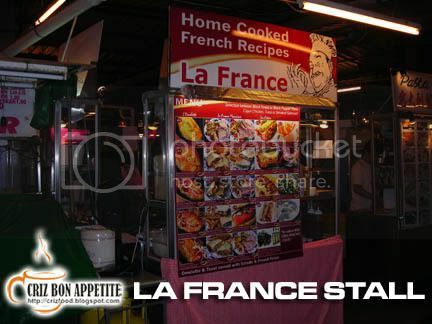 For the French, those dishes are homemade food that you can get practically anytime of the day. How was the food then? I would say I was very impressed with the quality of food served. Although it was not fine dining, it was one of the best French food that I had taken locally in years. The breads were of good quality, so were the crepes which were freshly made on spot. As for price, it was a good bargain for the quality food served. 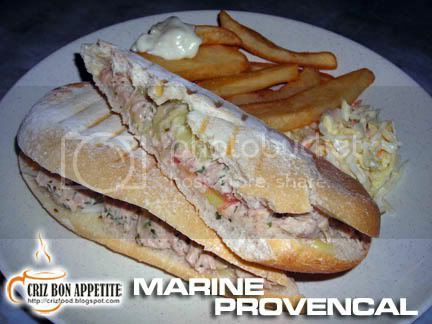 We managed to try out the Marine Provencal (RM9.80) which consists of a long Ciabatta Bread filled with large chunks of tuna fish mixed with Mozarella Cheese and sprinkles with herbs. It came accompanied with coleslaw and Pomme Frite (French Fries). It was marvelous! 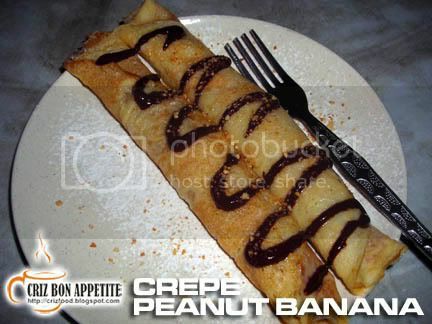 As for dessert, we ordered the Crepe Peanut Banana (RM4.80). It has thin soft crepe filled with banana precooked with grounded cinnamon and herbs. The crepe came in pairs with garnishes such as chocolate, grounded peanuts and icing sugar. Well, the French are the experts in decorating their food. This dish is a must try for those sweet tooth people out there. Do you know what is so great about this place? It’s MSG free for a healthier diet and most importantly, it’s tax free! If you have the opportunity to be there, do also try out their Omelette Fromage, Omelette Jambon-Fromage, Omelette Forestiere and Omelette Primeurs. To get there is real easy. Just drive along Jalan Sultan Ahmad Shah where the Northam Hotel is and turn left into the Northam Beach Café. The stall is strategically located within the dining area. 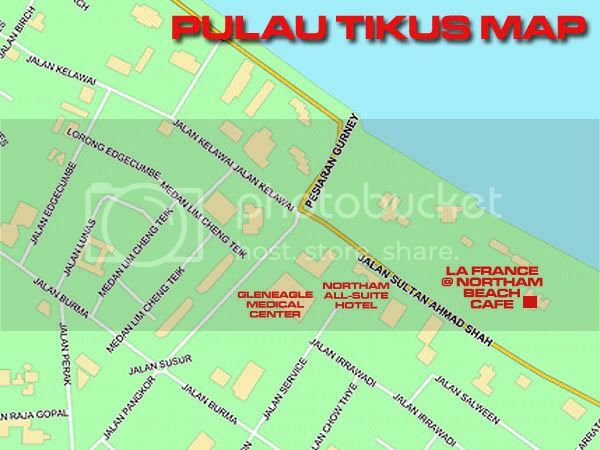 Address: 58, Jalan Sultan Ahmad Shah, 10050 Penang, Malaysia. Wow…sure to drop by for such nice french cuisine in an outdoor environment. hey there.. i tried the food there too, and it’s amazing!! very very well done and very very yummies!! they open at 6pm yar?? i can’t wait to go back..